Peanut warehouse capacity, particularly in the Southeast, could reach its limit as the 2016 crop comes in, and farmers need to make sure that their peanuts will have room in a Commodity Credit Corporation-approved warehouse. Peanuts not stored in approved warehouses cannot enter the federal peanut loan program. “You’ve got to do what makes the most sense for your operation and what makes the most sense to your banker. But for God’s sake don’t plant (peanuts) without knowing where they are going to be stored,” said George Lovatt, a peanut broker and president of Lovatt and Rushing, Inc., speaking to peanut farmers at the Georgia Farm Bureau annual convention Dec. 7. The U.S. 2015 peanut production is expected to be 3.16 million tons and that will be adding to an already 1 million ton carryover from the 2014 crop. Expected total use, or consumption, for the next year will be around 2.7 million tons, which is up and going in the right direction, but leaves a potential 1.38 million ton unused supply from the 2015 crop that will carryover July 31, 2016, which marks the beginning of the 2016 peanut crop marketing year, said Nathan Smith, peanut economist with the University of Georgia Extension. A decade ago, the industry liked to have 500,000 tons in carryover reserve to keep the shellers shelling and the pipeline moving through late summer until the next season’s harvest rolled through the system in fall. That “comfortable” carryover supply began to inch closer to 650,000 tons four to five years ago, Smith said. With the 2015 harvest finished, it is clear now the 2015 carryover supply is more than double what it comfortably needs to be, Smith said. 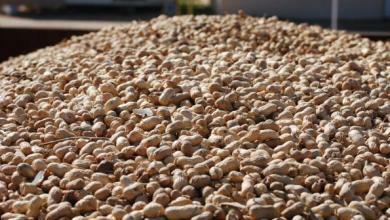 The 2015 carryover supply can be attributed to the increase in peanut acreage this year. Peanuts were the best bet in 2015 for growers who had a history of growing peanuts. About 1.62 million acers were planted in 2015, about 20 percent more than was planted in 2014. Most peanuts were enrolled in the Price Loss Coverage safety net program. The PLC program didn’t encourage more planted peanut acres, but simply was the best worst option for Southeast growers facing tough economic times with crop prices sinking below breakeven levels. Smith says CCC-approved peanut warehouses capacity is about 3.5 million tons nationwide. In the Southeast, the capacity is about 2.4 million tons, which includes antidotal information that warehouse capacity has increased by 150,000 tons in the last two years. Crop prices are not predicted to improve in the near term. Both Lovatt and Smith expect 2016 peanut acreage will be less than what it was in 2015 but not too much less, and this will put a strain on warehouse space for peanuts for the 2016 harvest. Georgia, the country’s top peanut-producing state, forecasted peanut production remains at 3.43 billion pounds, up 40 percent from 2014, with a state average yield of 4,400 pounds per acre. The U.S. average peanut yield sits now at 3,902 pounds per acre, according to USDA’s Dec. 11 oil crop outlook report. Growers will remember 2012 as a record production year that provided a 1.385 million ton carryover into the 2013 season, and the carryover has carried on since. This year’s carryover might be the record setter. One unknown factor, however, for the peanut supply line for 2015 will be South Carolina’s peanut production. Historic floods hit peanut-producing parts of the state in early October, crippling harvest for a peanut crop that had already been through intense midsummer heat and drought, which hampered yield potential. South Carolina growers, according to USDA, might reach 3,000 pounds per acre average. Estimates vary on how much of the planted 113,000 acres of peanuts in South Carolina will end up shelled, but due to the drought and flooding, 60 percent to 80 percent likely won’t, he said, which could end up knocking 100,000 tons off the anticipated carryover into 2016 season. U.S. peanut exports remain consistent, with an expected 500,000 tons of the 2015 U.S. peanut crop expected to go to Canada and Mexico and a few tons overseas, Smith said.